Players (with Pucks) line up along the side boards at the hash marks. One player below the goal line. Player 1 passes to player 2 then moves across the slot for a return pass from player 2. Player 2 makes a return pass to player 1 then moves to the net for a deflection. 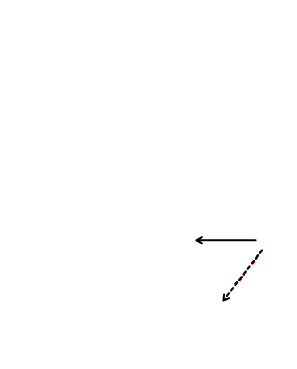 Player 1 shoots then moves down below the goal line to receive a pass from player three. Player 2 deflects then returns to line. The same sequence is repeated from the opposite side. Drill should maintain a high tempo. Goalie should always maintain good position on the puck and may attempt to block slot pass if desired. 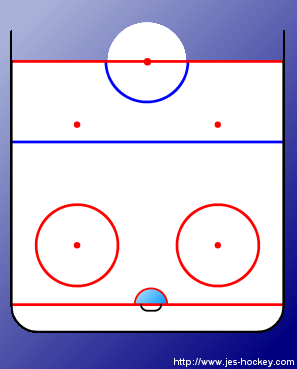 Players could use only backhand passing and shooting. Players could use "one-time" passing and shooting.